For some it’s shake-in-your-boots daunting and for others (like me) it’s the most incredible feeling there is! Do you know what it’s like to be on TV? I don’t think you will really know until you have done it yourself. But here’s my view on some amazing opportunities I have gotten to go on air. My first time on TV was on Top Billing with Jeannie Dee in 2013. At that time, I was unmarried, running a Pilates studio and kitesurfing part-time. The day started off early in the morning, filming in my Pilates studio and ended off early evening on the beach, with a kitesurfing session. My now husband, Neil, was a also a part of the kitesurfing segment. There were two things that really surprised me about my first TV interview, which I would never have expected until I experienced it for myself. First of all, I was shocked at how we filmed the entire day and then only ended up with 5 mins of actual TV time! It really makes one realise how much time and effort that goes into making a successful TV show. The second thing that was surprising is how all the interviews are filmed twice. First, the camera is on the person being interviewed while the presenter asks the questions. And then they film it all over again, only with the presenter asking the questions. My most recent TV interview was also on Top Billing! 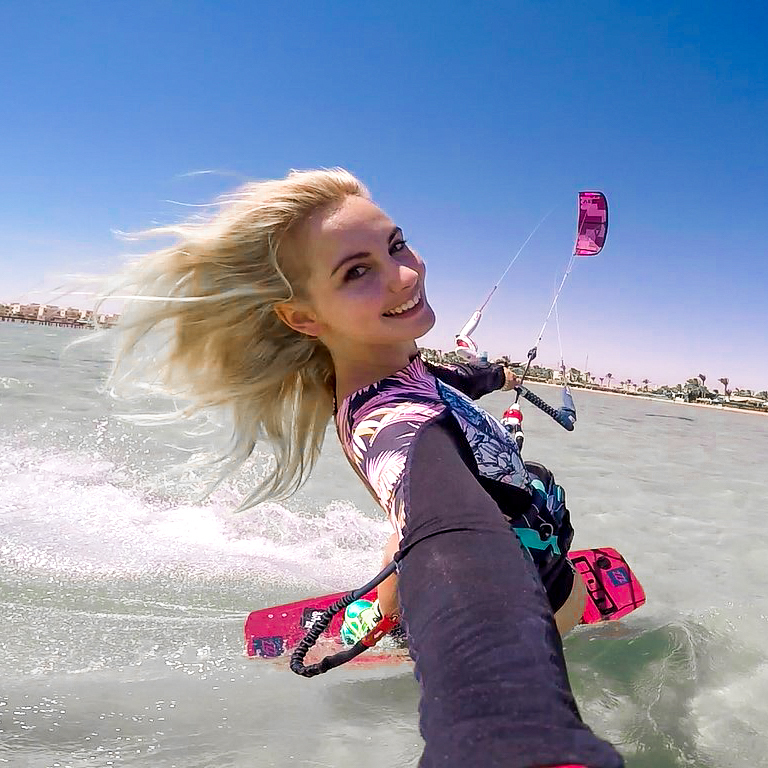 This time, I was married and I went on as a professional kitesurfer, influencer and blogger. Neil was a part of the whole thing and by the end of it, I felt as if the crew was a part of my family too! We had the most incredible day exploring Langebaan with lots of laughter, boat rides, amazing wind and then celebrations afterwards. One of the most memorable things about both times on Top Billing was how friendly and welcoming all the crew and presenters are. They truly make you feel comfortable and ensure that you enjoy every minute of it. Another very different way of being on TV is during a live interview. Some of them are filmed live and then aired unedited a few days later – like when I went onto Sports Federation TV on Cape Town TV. It’s definitely scary doing a live interview, but in this case they have a few days to edit something out if they really really need to. I’ve been blessed enough to already have been on Sports Federation TV twice! But then you get shows like Expresso morning show where it is filmed and aired live and there is no chance to mess up! I think the reason they call the show Expresso is not because it starts so early in the morning, it’s because you need a STRONG Expresso to keep up with the energy on set! Funny thing is, they actually do make you a STRONG cup of coffee the second you get to the waiting room. After a few nervous minutes in the waiting room, the rest of the morning was a blur. Fortunately, things happened so quickly after that, that there was no more chance for nerves! Every minute matters on a morning show. One minute in make-up, one minute to run to the set, one minute to meet the presenter. But then once the many cameras and lights are shining on you and they count down the last minute before your interview, time stands still! I don’t know how those presenters do it every morning. I wouldn’t be able to rush around like that so early in the morning, and yet they do it while keeping the energy high and making their guests feel most welcome. If there’s something I’ve learnt about being interviewed on TV – it’s that it’s hard work making a TV show and the presenters as well as everyone behind the scenes work much harder than anyone could ever realise. At the start of this blog I mentioned that you can’t predict how you will feel about going in front of the camera until you have done it yourself. Why I say this is that I honestly thought I would not enjoy it! I am an introvert, feeling self-conscious talking to strangers and sometimes I stutter. But something magical happens when I step in front of the lens. A new-found confidence arises, my stutter is gone and I can speak for hours without messing up. Neil on the other hand, is an extrovert and has no problem talking about anything to anyone. He never feels shy or self-conscious, except when he goes on TV! We spoke about it and realised it’s because when I speak to the camera or the presenter I feel like I am not speaking to anyone at all. Neil on the other hand, feels like he is speaking to everyone in the world and he can’t control their reaction. I really hope I get a lot more opportunities to go on air! It truly gets my adrenaline pumping and the second each interview is done, I am left wanting more!